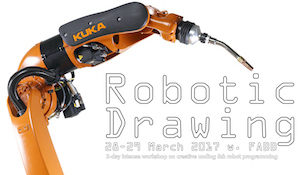 FABB will be hosting a 2 days intense workshop on creative coding and robot programming. A Calligraphy pen is attached to the robotic arm as an end effector. Based on the brightness value of the image processed, an algorithm generates the path to be drawn.